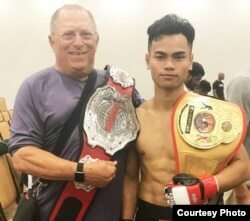 Speaking only a few sentences of his native language, Theo Rlayang, 24, who fled Vietnam when he was a child with his family, wants to compete in the Ultimate Fighting Championship (UFC) in the United States. He arrived in the United States through a UN camp in Cambodia in 2002 after escaping persecution in Vietnam. Besides going to college, he pursues Mixed Martial Arts (MMA). Rlayang is an amateur fighter and has won five out of six fights so far. “My plan is I want to just become the best fighter too, you know, that I want to go to the big orientation like UFC or like get all the belts, get all the championship, you know... because there is like … there’s never been an Asian UFC champion,” he said. His dream is to get different belts from different weight classes. In the past several years, Rlayang earned two titles from the fights, in the 145-pound weight class and 155-pound class. It was here in North Carolina where he lives and another one from Virginia. He says he wins by outwitting his opponents. “I think you have to be well rounded, you can’t just focus on one style. Not only one style is going to work, you have to be prepared for anything like withstanding and striking, but for me, I try to just be more aggressive to push the pace when I do kicks, I throw like a bad intention to try to hurt them,” he said. In one fight, he says he fractured his thumb and his nose was bleeding badly, but he does not feel pain because of the adrenaline rush he gets during a fight. When he lost his first fight he said he was saddened and thought that his life was over. He dropped out of school in his second year and pursued only martial arts. “I thought my life was over, even though I know [it didn’t]. In a way, I thought the world ended for me, but then I have to learn from there and then it’s like that’s not the end of the world,” he said. He has never had professional training, but he dreamed of becoming a successful fighter since he was a young child. “Really, I started doing martial arts, MMA, because I always wanted to try and I became fascinated about it. But the main reason why I started it, I like to challenge myself because I had a lot of personal issues when I was a kid. “I saw myself as weak,” he said. Rlayang learned a lot from his initial defeat and worked hard to improve his physical and mental state with his coach, John Salter, a champion national wrestler. Peter Maguire and Theo Rlayang are seen sparring in Wilmington, North Carolina. (Photo courtesy of Peter Maguire). Peter Maguire, a martial artist who introduced Jiu Jitsu to Cambodia in 1994, said he was impressed with Rlayang. “Because the Montagnards were some of the greatest fighters in the Vietnam War, I decided to help him find more sophisticated trainers to help him with the part of his fight game that he was lacking,” he said. Rlayang said when he fights he is going to balance stamina and make himself “like a machine” that can keep going all day without feeling tired. Theo is scheduled to fight again on Saturday evening at the Ted Constant Convention Center in Norfolk, Virginia. Theo fled Vietnam to live in a UN camp in Mondulkiri province in Cambodia’s east in the early 2000s when Vietnam persecuted the Montagnards, restricting their religious freedom, and engaging in land grabbing. “They view us as a lifelong enemy because we helped the Americans in the Vietnam war as special forces. [The US trained] Montagnards were trained to fight communism and so they view us as the enemy or traitors,” he said. Rlayang said his family’s journey to America from Vietnam through Cambodia was dangerous as the Vietnamese army was patrolling along the border where they fled. “Because if we got caught, we got killed,” he said. He said his aunt, carrying a crying baby, was forced to go back to the village as the army may have heard and arrested them all. He also said that he was left in the camp after arriving as his dad went back to bring all the members of the family. His parents and the rest of the family now live in Greensboro, North Carolina. “A lot of our people want to just live peaceful lives. We didn’t at first, we didn’t really care about all the political stuff. We just wanted to be left alone and do our own thing. But it’s kind of hard when you get some of them coming onto your land, and sometimes taking your stuff, and your lands and properties and just treat you unfairly,” he said.